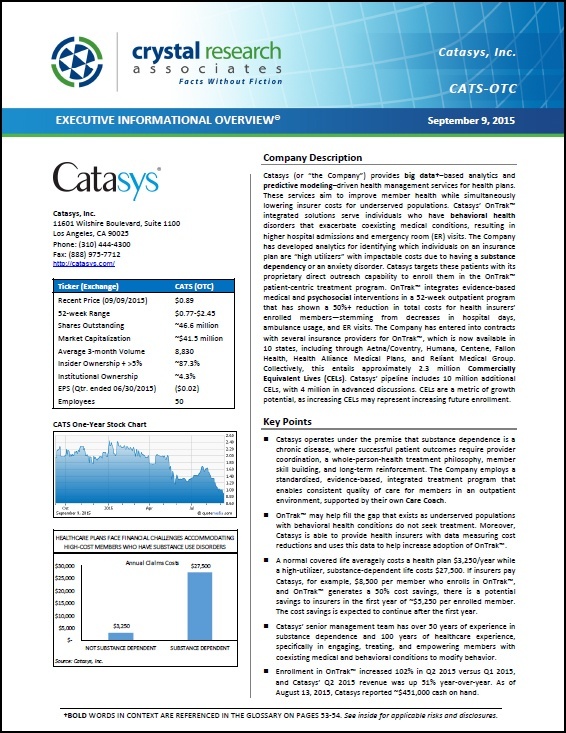 First Quarter 2016 Update on Catasys, Inc. This week, Catasys, Inc. (CATS-OTC) reported its financial results for the first quarter 2016, ended March 31, 2016. 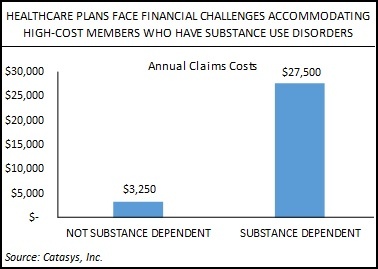 Catasys provides Big Data–based analytics and predictive modeling–driven behavioral healthcare services to health plans and their members through its 52-week, outpatient OnTrak programs. The company reports that patient enrollment in its programs has increased by more than 175% since the beginning of 2015. Over the past several decades, there has been a change in how the U.S. views mental health issues. Today, a conversation about a tragic shooting has transitioned from being an “NRA issue” to a “mental health issue,” with these topics being picked up by industry, media, and politicians alike. With near-daily news reports of teenage or young adult suicides, attacks on family, military, schools, movie theaters, and so on by undiagnosed and untreated individuals, and a rise in accidental drug overdoses from both illicit and prescription products, today's conversations have begun to focus on increasing fairness in health insurance for behavioral and mental health conditions while reducing the stigma, costs, and hopelessness of seeking treatment for those who are suffering from a mental or substance use disorder. New Slide Deck Available on Catasys, Inc. Crystal Research Associates has released a slide presentation on Catasys, Inc. (CATS-OTC) to summarize major facets of Catasys' treatment program, value proposition for health insurance providers, and market opportunities, as presented in greater detail in the 56-page Executive Informational Overview available for download here. Crystal Research Associates has released a 56-page Executive Informational Overview (EIO) on healthcare service and data analytics company, California-based Catasys, Inc. The EIO details Catasys' business model, technology development, customers and end users, treatment approach, opportunities in the behavioral healthcare market, competition, and more. The report is available for download below.